^ Stephen Skinner & David Rankine (2008). The Veritable Key of Solomon. Llewellyn. p. 24. ISBN 978-0738714530. ^ a b Rohrbacher-Sticker, Jewish Studies quarterly, Volume 1, 1993/94 No. 3, with a follow-up article in the British Library Journal, Volume 21, 1995, p. 128-136. Davies, Owen (2009). 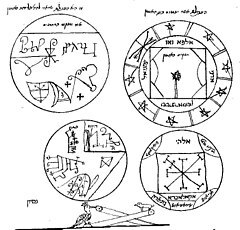 Grimoires: A History of Magic Books. Oxford University Press. Peterson, Joseph H. (2001). The Lesser Key of Solomon. Weiser Books. Samuel Liddell MacGregor Mathers, Aleister Crowley, Hymenaeus Beta, The Goetia: The Lesser Key of Solomon the King (Illustrated Second Edition). Samuel Weiser, 1995.